They’re back! Those funkadelic aliens have returned for another round of presents-fueled action! ToeJam and Earl are set to make a comeback on PCs later this year in their fourth adventure, and one of the original creators, Greg Johnson, is behind the effort. He and Mark Voorsanger own the rights to the characters, and that’s a great thing, as we may not have otherwise had a chance to see the beat-boppin’ duo again. Johnson’s team is small, and he wants to keep it that way in order to ensure the most creativity – and the least amount of outside interference in the design – as possible. And the way the game seems to be coming along, even at this early stage, it seems like he made the right choice. Titled Back in the Groove, this fourth installment begins with ToeJam and Earl taking their friends Peabo and Lewanda out for a spin in their RapMaster Rocketship. They swing by Earth, the source of all their past adventures, and Peabo succumbs to the urge to press the shiny, new button on the ship that activates a black hole, tearing the ship into pieces (again) in the process and forcing the group to reassemble it. Johnson states that new things will happen when ship pieces are found, and that players will actually be able to fly the fully repaired ship! The game retains many of the same elements that made the original such a classic, such as sprite-based character graphics, random levels, and a fixed, isometric perspective for a wide view of the playfield. The screen can also be zoomed in or out at any time, and the 3D engine lets players see the levels below the one they are currently exploring, which should come in handy when they want to jump or if they fall off the edge. All the Earthlings and presents from the original game will appear, but Johnson is also promising new ones, such as secret winged presents. Some gameplay elements from Panic on Funkotron will also make an appearance, like the Jam Out and hidden presents and coins. Certain elements (like character stats) will also now carry over from one play session to the next. Players will be able to collect special hats that will boost abilities temporarily or improve certain character stats permanently. Moreover, as players complete each game, they are rewarded with more pages of the ToeJam & Earl comic book that Lamont the Funkopotumus is drawing about the character’s life stories. By completing it multiple times, they can obtain the complete comic book. 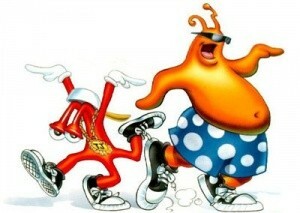 The biggest news is that the emphasis will be on cooperative play, which was a huge part of what made ToeJam & Earl so much fun to play. Back in the Groove will sport four-player simultaneous online and two-player local multi-player (they’re working on increasing it to four-player). We assume that Latisha, who was introduced in part three, will be the third character, but there’s no confirmation on who the fourth will be (Peabo perhaps?). Players will now be able to freely text chat between them as they play, ride on each other’s backs (! ), and the game allows for horizontal split-screen movement when the two players get separated. Characters can be customized and collect experience that can be exchanged for improved abilities. This is a very early prototype, but there is a lot of promise here. Animation will be improved, as will the environments and frame rate. Johnson is passionate about the characters and is very open to feedback from fans. His team is taking its time with this in order to make it the best game possible, and having the original creator free from publisher demands has removed a major hurdle from achieving that goal. Back in the Groove is now on Kickstarter, and while this avenue hasn’t proven to be effective for several other Genesis franchises seeking a reboot, this one seems to be doing quite well right out of the gate. The many different reward tiers include goodies like posters, mugs, t-shirts, and a set of awesome vinyl figurines. This has the potential to be the ToeJam & Earl game we’ve always wanted, and it will be interesting to see how it plays out. We’ll definitely be covering this one in depth. Head over to the official Kickstarter page and on Facebook for more information and offer your support! It’s not every day that we get to see the original creators of a true Genesis classic get another crack at bringing fans what they want, and Johnson and company are very receptive to the fans’ feedback about past games to ensure the best experience possible. DUDE!! How did THIS slip by me?????? This is so great! I really hope the team get to accomplish eerything they want. TJ&E deserve it.